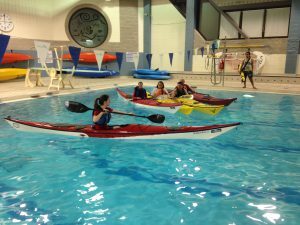 The Complete Paddler offers instruction in Kayaking, Canoeing and Stand Up Paddling year round in a heated pool. We cover basic, intermediate and advanced techniques, depending on the course you choose. Whether you are new to paddling and want to build your basic skills, want to perfect your brace/roll or just want to practice in a pool, we have a course for you. Book online or call us at 416-255-6905. We offer customized courses in the lake or river anytime and anywhere! $250.00/per person, plus tax for a two-hour session. Advance booking is required. Please call us 416-255-6905 for more information. All of our instructors are Paddle Canada, ORCKA and/or BCU Certified.